Canada’s oil and gas industry takes seriously its responsibility to conduct fracking in a way that safeguards the quality and quantity of water. The industry understands that increased use of fracking has raised questions about the amount of water it requires and if fracking can contaminate local surface and groundwater. Scientific evidence indicates that water contamination from the frac zone has not occurred. This is partially due to the significant vertical separation between the target zone for fracking and freshwater aquifers. Fracking generally occurs between 1.5 and 4 kilometres below the surface. Drinking water aquifers are typically less than 300 metres below surface. In addition, wells are constructed with multiple layers of steel casing and cement to ensure the fluids that flow down and up cannot migrate outside of the well. 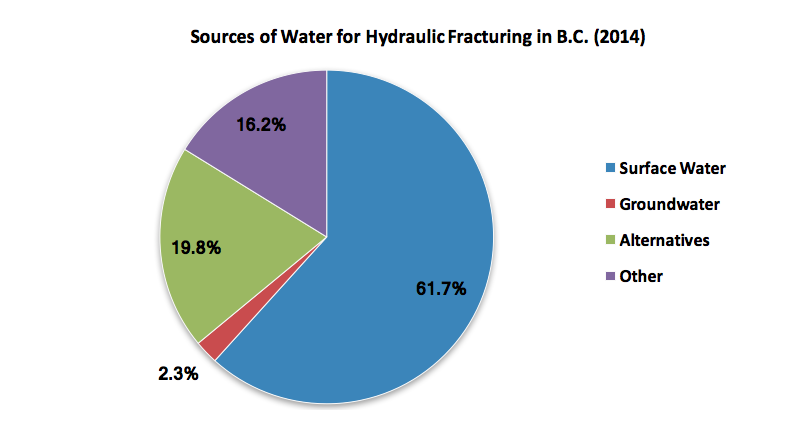 Water volumes required for fracking vary greatly from region to region. Small volume fracs could be 500 to 2,500 m3 per well, moderate volume fracs might be 10,000 to 50,000 m3 per well, while high volume fracs could lie between 50,000 to 100,000m3 per well. For comparison, a golf course will use ~20,000 m3 of water every 28 days. The same amount of water will grow nine acres of corn each year. To learn more about the range of water volumes used in different regions, go to FracFocus and search wells in a specific area of interest. Water for a specific frac job might have several different sources, including: surface water bodies, groundwater, and industrial waters including recycled frac water. These sources are mixed at the wellsite. Regulators require permitting and tracking of water allocations and water used by operators. Government regulators monitor water use carefully. Water obtained for fracking must have appropriate approvals and permits. 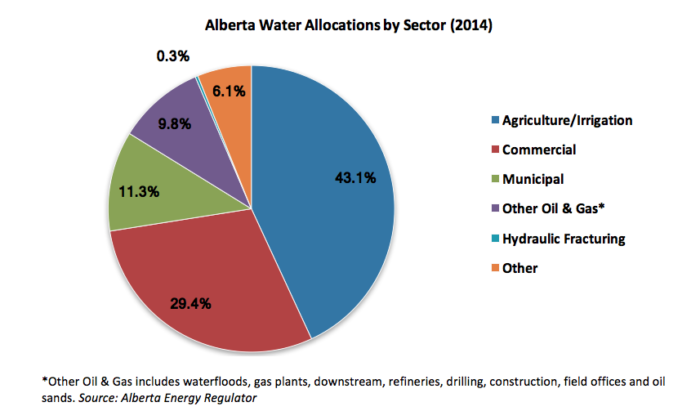 Regulators in each province allocate water for industry and other users. The Northeast Water Tool (NEWT) is a tool that aids in water allocation in British Columbia. It provides guidance on water availability and is used to support decision-making for water-use approvals and licenses. A significant portion of the frac fluid that is pumped into the target rock to create cracks, flows back to the surface in the first weeks after fracking of the well is complete. This fluid is called “flowback” and the remainder of the flowback can flow to the surface over for up to several months. Flowback fluid is either recovered and held temporarily at the wellsite in containment tanks or, if a flowline is in place, it is recovered and stored at a central processing facility. 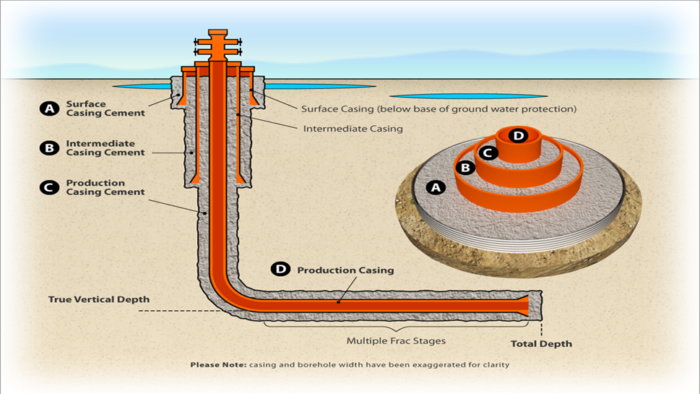 Ongoing production from a fracked well may also continue to yield fluid. This is called produced fluid and it represents fluids that exist within the targeted rock formation. A key element for safe handling and management of fluids related to fracking is permanent disposal of waste fluids. This part of oil and gas operations is closely regulated. For more information in British Columbia, see Disposal Wells: Produced Water summary sheet, and in Alberta, see Directive 051. The provinces have regulatory oversight of water sourcing, transportation, recycling, storage and disposal. Regulators in Alberta and British Columbia, place great importance on mitigating risks to surface water and non-saline groundwater sources. Canadian Society for Unconventional Resources (CSUR) has compiles a report on the Canadian Water Regulations Applicable to Hydraulic Fracturing Operations. The vertical separation between freshwater aquifers and the targeted oil or gas reservoir being fracked is several hundred metres. Drinking water aquifers are typically less than 300 metres below surface. Fracking typically occurs 1.5 to 4 kilometres below surface, making the separation between fracking and freshwater several thousand metres.